செவிக்கு இன்பம் ஆவது புண்டரீகாக்ஷனான எம்பெருமானுடைய திருநாமமே; அந்த இனிய திருநாமமே இப்பூவுலகில் வசிப்பவரெல்லாம் கவலையற்று ஒதுங்குவதற்கு இடமாகவும் அமையும். மகா புருஷனான ஸ்ரீமன் நாராயணன் ஒருவன் மட்டுமே பாசுரத்திற்கு நிறைந்த பொருளாயிருப்பவன் . அவனையே தெய்வாதீனமாக அடையப்பெற்றேன், ஆராய்ந்து பார்த்தால் வேதங்களில் தேர்ந்த பொருளும் அவ்வளவே. On day 4 of Kodai Uthsavam, it was chinna mada veethi Kulakkarai purappadu for Sri Parthasarathi who was exceptionally beautiful adorning another different crown. Nanmukan Thiruvanthathi of Thirumazhisai Alwar was rendered. Alwar tells us : - the sweetest music to ears if the name of Lord Sriman Narayana who has beautiful red eyes; He and His feet are the refuge of all humanity, whom I have arrived and praising with poetry. He is the centric of all poetry, worthy of it (for praising others, one would only make wrong exaggerated comparisons) - Come to think, it is the very substance of the Vedas. எம்பெருமானை நினைத்த மாத்திரத்திலே, அவனது - தேஜஸ்ஸும், பராக்ரமமும், செல்வங்களும், அழகிய ரூபமும், குற்றமற்ற நற்குலமும் மற்றுமுள்ள நன்மைகளும், நம்மை நலம்புரிந்து வந்தடையும். எம்பெருமானின் அவதாரங்களிலே இராம அவதாரமும் கிருஷ்ணாவதாரமும் மிக்க சிறப்புற்றவை. சக்ரவர்த்தியான ஸ்ரீராமபிரான், சகல சிறப்புகளும் மிக்கவன். மிகுந்த உயரிய குணாதிசயங்கள் கொண்டவன். Sri Rama was the embodiment of Dharma; He was a good man endowed with great valour coupled with all virtues. He was the King of all Worlds yet chose to go to the forest forsaking all pleasures obediently following the words of His father to Kaikeyi. At Thiruvallikkeni divyadesam today is day 3 of Kodai Uthsavam and Sri Parthasarathi had chinna mada veethi, kulakkarai, gate house purappadu. Here are some photos of the evening. Credits : readramayana.org and dravidaveda.org. The aim of life is to reach Him by serving Him and those who do kainkaryam to Him. Srivaishnavaite way of life is singing paeans, chanting divyaprabandham, doing service and having darshan at His various abodes. For us, Kovil Thirumalai Perumal Kovilwould mean the divyadesams of ‘Thiruvarangam, Tirumala Thirupathi and Thirukachi’. When we think of temples, the one at Thiruvallikkeni and other divyadesams – its tall gopurams, the divine Vimanas and the most merciful Moolava vigrahams and blemishless Uthsava vigrahams come readily to mind. There are more ~those sung by Alwars being 108 Sri Vaishnava divyadesams and the centuries old temples associated with our Acharyars being ‘Abimana sthalams’. Just like our Kovil Ozhugu, there is Madala Panji, a chronicle describing the historical events of Odisha Jagannath Temple. In the state of Odisha [Orissa] lies the famous ‘Jagannath temple’ in Puri, situate on the east coast. The moolavar idols of Northern India are different than the ones in South India, mostly in white marble. Puri Jagannath is different – Perumal is made of sacred wood, which are ceremoniously replaced after few years. The Navakalevara ceremony is an intricate set of rituals that accompany the renewal of the wooden statues. The Puri temple was built in the 12th century atop its ruins by the progenitor of the Eastern Ganga dynasty, King Anantavarman Chodaganga Deva. The temple is famous for its annual Rath Yatra, or chariot festival, in which the three main temple deities are hauled on huge and elaborately decorated temple cars. Lakhs of devotees descend here at this holy temple town for this festival. Inside the huge temple, the presiding deities are : Sri Jagannath (Lord Krishna), Balabhadra (Balarama) and the Goddess Subhadra constituting trinity of deities worshiped at the temple. The temple iconography depicts these three Gods sitting on the bejewelled platform [ Ratnabedi ] in the inner sanctum. Lord Jagannatha is the supreme God and the sovereign monarch of the Odishan empire. The Deities are adorned with cotton and silk fabrics, Gold Ornaments studded with precious stones, flowers of different varieties, Tulsi leaves, sandal paste, camphor. These articles are used in the daily and periodical rituals. 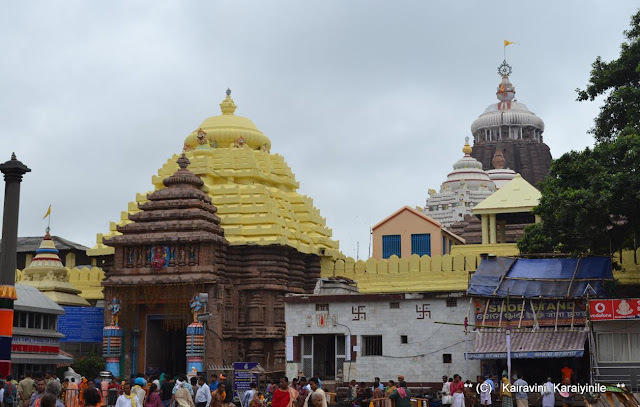 Lord Jagannath temple at Puri is built on a gigantic raised platform. The temple complex is enclosed by a wall about seven meters high. The area of this platform is more than 4,20,000 sq.ft. The wall is pierced by four gates, facing the four directions. On the east-facing gate, there are stone images of two lions and it is called the Simha dwara [Lions Gate]. The north, south and west facing gates are similarly known as the Elephant Gate, the Horse Gate and the Tiger Gate. As one stands at the Simha dwara, there is a monolithic pillar about 10 meters high. This pillar is known locally as the Aruna Stambha, associated with Aruna, charioteer of the Sun-god. The main temple is a curvilinear temple and crowning glory is the 'Sudarshana chakra / Ssrichakra' (an eight spoked wheel) of Vishnu. Also known as the "Nilachakra", it is made out of Ashtadhatu and is considered sacrosanct. The vimana or tower is 215ft high, and in the evening, a temple sevaka called Garuda sevaka climbs up to the tower to tie pieces of cloth on the flagpole. This chakra is visible from almost all parts of Puri and would appear to be facing you from wherever you are. The flag atop is believed to flap in the opposite direction of the breeze. The temple is situate on expansive landscape and attracts crowds throughout the year; it swells by a few more lakhs during the annual Rath Yatra. Sure you have heard of the word ‘juggernaut’ which in English language is a literal or metaphorical of mighty force that is rolling. The word is coined in an allegorical reference to the famous Temple Car of Puri. The word has its origin to Sanskrit Jagannātha ("Lord of the Globe", combining Jagat ("world") and Natha ("lord"), which is one of the names of Krishna found in the Sanskrit epics. 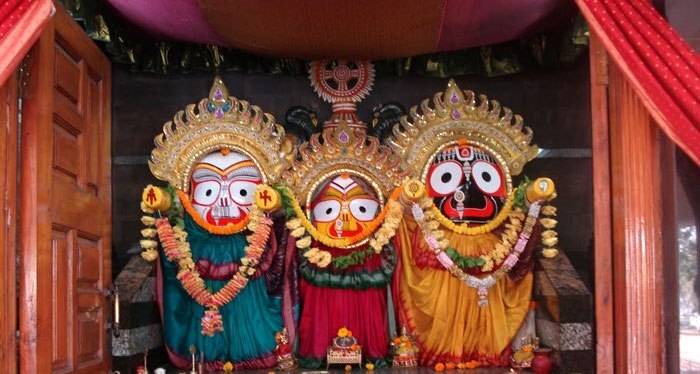 The annual Rath Yatra is celebrated in the month of Ashada [June-July] whence the Presiding deities Lord Jagannatha along with Lord Balabhadra and Subhadra – come out of the main temple for an annual sojourn on decorated chariots, travel to Gundicha temple about two and half miles to the northeast. The festivity is of very huge proportion, living embodiment of the synthesis of the locals, showcasing the rich traditions of arts of Odisha. Each year, the three chariots are constructed anew and decorated by a large group of dedicated artisans of carpentry, ironsmiths, tailors, sculptors, painters and other skilled. The chariots of Lord Jagannatha, Balabhadra and Subhadra called Nandighosa, Taladhvaja and Devadalana have 16,14, 12 wheels respectively and are over 40 ft tall. They are tastefully decorated with painted wood carvings, Parsav devatas and a sarathi [charioteer], appliqué patterns, flat metal shape and profuse flower garlands. The chariots have canopies of different coloured cloth. The much awaited event – the ‘Ratha Yatra’ takes place on Asadha Shukla dvitiya, the 2nd day in the bright fortnight of the first monsoon month. First in pahandi, the deities come out of the Temple to the blowing of trumpets, ringing of bells, claning of cymbals, beating of drums reaching a crescendo. 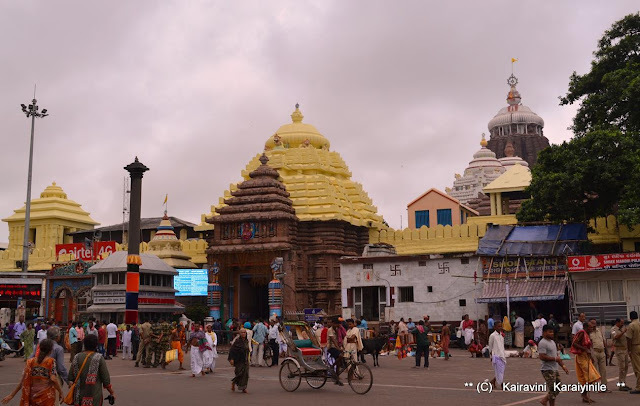 The Gajapati king of Puri sweeps the floor of each chariot with a golden broom, sprinkles flowers and fragrant water. Then occurs the pulling of the Chariots after the wooden horses are tethered. 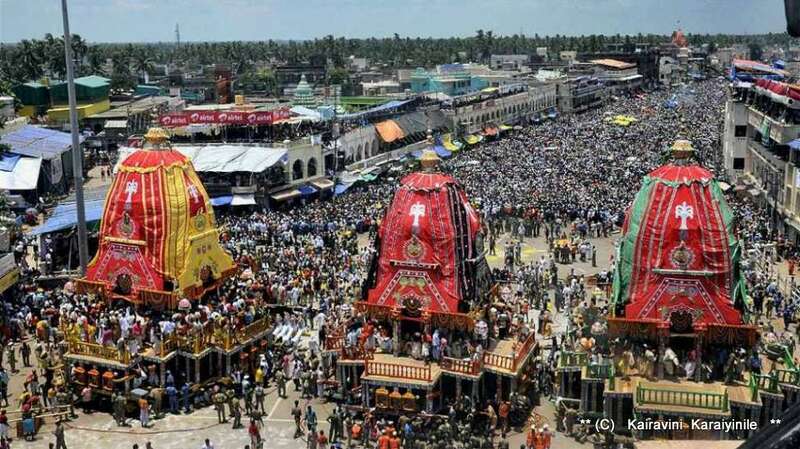 The chariot of Lord Balabhadra moves first, then Goddess Subhadra and then Lord Jagannath – a sea of humanity fills every inch of the grand avenue of Puri and lakhs throng the famed Puri for having darshan of this Rath Yatra. The destination is the Gundicha temple, considered the birth place and their garden house. The deities are kept and worshipped here for a week, then they ride their chariots back to the main temple. A visit to the holy land kindles our spirits and makes us feel happy enjoying the divine sublime atmosphere. Here are some photos of the Rathas taken last year. Today 25th June 2017 is day 2 of Kodai Uthsavam at Thiruvallikkeni. It is hot and humid, may not be that sweltering heat of April, May but Chennai it yet to cool down. For us life is riddled with difficulties – one seeks solace in God – Sri Boothath Alwar tells us the simple way of life and reaching heavenly abode, by chanting the various names of Sriman Narayana. எம்பெருமானுக்குப் பல்லாயிரத் திருநாமங்களுண்டு; அவற்றில், திருமேனி முதலியவற்றுக்கு வாசகமான திருநாமங்கள் என்று ஒரு வகுப்பும், விபூதி விஸ்தாரங்களுக்கு வாசகமான திருநாமங்கள் என்று மற்றொரு வகுப்பும் கொள்ளத் தக்கன. ஸ்ரீவத்ஸவக்ஷா; புண்டரீகாக்ஷ:, பீதாம்பர:, சார்ங்கீ, சக்ரபாணி:- இத்யாதி திருநாமங்கள் முந்தின வகுப்பைச் சேர்ந்தவை; லோகாத்யக்ஷ:, ஸுராத்யக்ஷ:, ஜகத்பதி : - இத்யாதி திருநாமங்கள் பிந்தின வகுப்பைச் சேர்ந்தவை. ஆக இவ்விரு வகுப்புகளையுந் திருவுள்ளம்பற்றி, முதலடியில் “நாரணன்றன் நாமங்கள்” என்றும், இரண்டாமடியில் “மற்றவன் பேர்” என்றும் அருளிச் செய்யப்பட்டுள்ளது. ஸ்ரீமந் நாராயணனுடைய திருநாமங்களையும் மற்றும் அப்பெருமானுடைய (விபூதி விஸ்தாரங்களுக்கு வாசகமான) திருநாமங்களையும் ஞானத்தால் உள்ளபடியறிந்து, அவன் மேல் (ப்ரேமத்தின் முடிவெல்லையான) ஸ்தானத்திலே நின்று அனுசந்திப்போமேயானால், நமக்கு பந்துக்களையும் எப்போதும் கைங்கர்யபரர்களாயுமுள்ள நித்யஸூரிகளுக்குத் தலைவனான எம்பெருமானுடைய தன்மையாவது, பரமபதத்திற்கு அலங்காரமான நித்யஸூரிகளாக (நம்மை)ச் செய்துவைக்குமதுவேயாம். Alwar offers a simple solution ~ understand and know through revelations and chant the various names of Sriman Narayana, chanting His names and worshipping His many avatars and archavatars will secure us a place by His side in the comity of Gods in heaven. For a Srivaishnavaite, Acharyar leads and guides one to ultimate Sriman Narayana. My Acharyar is Cholasimhapuram Doddayachaaryar (presently Sri U. Ve. Kovil Kanthadai Chandamarutham Singarachaar Swamy). We the Sishyas of Swami belong to the lineage, which emanated from the Holy feet of Sri Periya Perumal, Periya Pirattiar, Senai Muthalvar, Nammazhwar, Naathamunigal, Uyyakkondar, Manakkal Nambigal, Aalavanthar, Periya Nambi, Emperumaanar, Koorathazhwar, Mudaliandan, Embaar, Battar, Nanjeeyar, Nampillai, Vadakku Thiruveethipillai, Pillai Logachariyar, Thiruvoimozhipillai, Maanavala Maamunigal, Vaanamamalai Jeeyar to Doddacharyar (of whose lineage we have the present head – Sri Singarachaaryar Swami). Understand that there were 5 Thirumaligais of the lineage of Doddacharyar earlier. Presently there are only two - the family of Swami Periyappangar Swami - of whose lineage is our varthamana Acharyar - Sri Ubhaya Vedantha Kovil Kanthadai Chandamarutham Singarachar Swamy; the other is that of Swami Vedanthachaar. Today 25th June 2017, was a great day for the sishyas as the Thirunakshathiram of Sri U.Ve. KKCP Periyappangar Swami was celebrated at Vanamamalai Mutt, Triplicane. Our varthamana Swami descended at Thiruvallikkeni and hundreds of sishyas and members of ‘Sri Koil Kandadai Chandamarutham Periyappangar Swami Sishya Sabha’ gathered to get the blessings of Acharyar. Tracing back our lineage, Swami Sri Doddachar was born in 1543 in the famous lineage of Swami Mudaliandan. In this Kaliyuga, we know that Thirukachi Arulalar directly conversed with Acharyan Thirukachi Nambigal … and centuries later, Sri Devathirajar had direct interaction with our Doddacharyar Swami too. The most famous amongst the brahmothsavam is the Garuda Sevai – at Thirukachi, Lord Devapperumal is taken in procession on vahanam of Garuda also known as Periya Thiruvadi. Garuda Seva has special significance not only for Kanchi, more so for Sholinghur because of Swami Doddachaaryar connection. Swami Doddayachar was an ardent devotee of Lord Varadharaja and did many kainkaryams to Him. He was a regular in the annual Vaikasi Garuda Sevai of Devathirajar. Legend has it that on a particular year, he was not well and could not attend the Garudothsavam at Kachi. He was feeling desperate about his misfortune of not being able to have darshan of PerArulalar at Kachi on Garuda vahanam. He lamented standing near the Thakkan kulam at Cholasimhapuram (Sholinghur]. He composed hymns on Lord Varadharaja, known as Sri Devaraja Panchakam. He longed for the Lord's sevai and these outpourings were a direct result. Emperuman will never let his ardent bhaktha down. He came down to Sholinghur and gave darshan to Doddacharyar - seated on Garuda vahanam. Such is the mercy and leela vinotham of PerArulalar. Continuing as it does, on every Vaikasi Garudothsavam day, there is a tradition known as Doddachaaryar Sevai, when the archakas hide Lord Varadar at the western gate for a short time with divine white umbrellas (ven thirukudai) just before He leaves the temple. It is believed that Lord goes to Sholinghur for giving darshan to Doddacharyar. The mangala harathi takes place thereafter. We are proud to follow the lineage of Doddacharyar and follow the footsteps of our Acharyan - Sri U Ve Koil Kanthadai Chandamarutham Singarachaar Swami. Here is the thanian of our Varthamana Swami…. This morning at Thiruvallikkeni, there was Thirupallandu, Thirupavai, Kovil Thiruvaimozhi, Sri Ramanuja Noorranthathi and Upadesa Rathinamalai goshti. Panchasamskaram was performed for some followers of the Mutt. Here are some photos taken during the festivities at Vaanamamalai Mutt. We were too fortunate to have Perumal theertham and Sripada theertham of our Acharyan and darshan of ‘Thiruvaradhana Perumal – Kannan’ of our Swami. With his kind permission, photo of Lord Krishna who gets daily pooja of our Acharyar is also posted here. Azhwaar Emperumaanar Jeeyar Thiruvadigale Saranam ! ஆழ்வார் எம்பெருமானார் ஜீயர் திருவடிகளே சரணம் ! நம் ஆச்சார்யன் திருவடிகளே சரணம் ! !